First full day in Dorset and a large amount of blue sky – my favourite colour! There was also quite a large amount of north-easterly wind keeping the temperature down but it looked like a fine day for walking. When the wind swings round to the west, things warm but tend to get wetter; we’d much rather have cooler and dry. Happy campers! Our neighbours at home, Chris and Derek, are Ramblers and had kindly lent us a detailed leisure map (2 inches = 1 mile) of the so-called Isle of Purbeck, which is where we are. It isn’t an isle, not even close, but who’s counting? We need a few quaint, inexplicable names. Chris and Derek had also lent us a book of the Ramblers Association’s top 50 British walks, one of which is a mere stones throw away. Off we set. 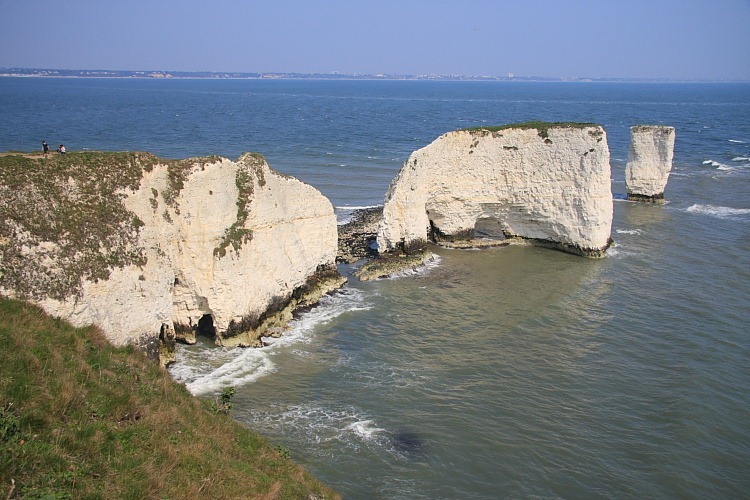 This walk was a 10km/6½ml circular walk taking in a section of the coast path passing The Pinnacles and Old Harry Rock at Handfast Point. 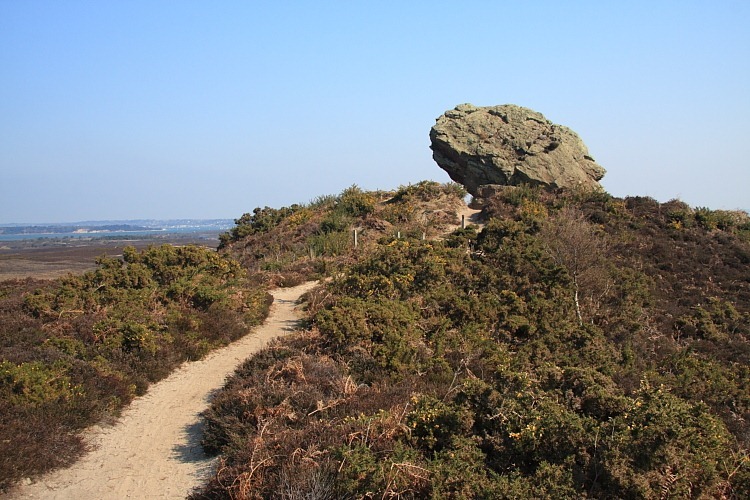 We began by crossing part of Godlingston Heath nature reserve to Agglestone Rock, a large lump of sandstone supposedly catapulted here by Satan. What a little devil he was! It does look quite impressive, standing here overlooking the heath all alone. Being sandstone, Agglestone Rock is very soft so generations of artistic degenerates have seen fit to deface it by carving various initials in it. Looking and admiring is apparently insufficient entertainment for some. Never mind, we realised and recovered our mistakes nicely and regained the correct route, making it to what seemed to be the main goal of this walk, The Pinnacles and Old Harry Rock. The Pinnacles are similar stack formations to the Twelve Apostles (now only six or seven) on Australia’s south coast. 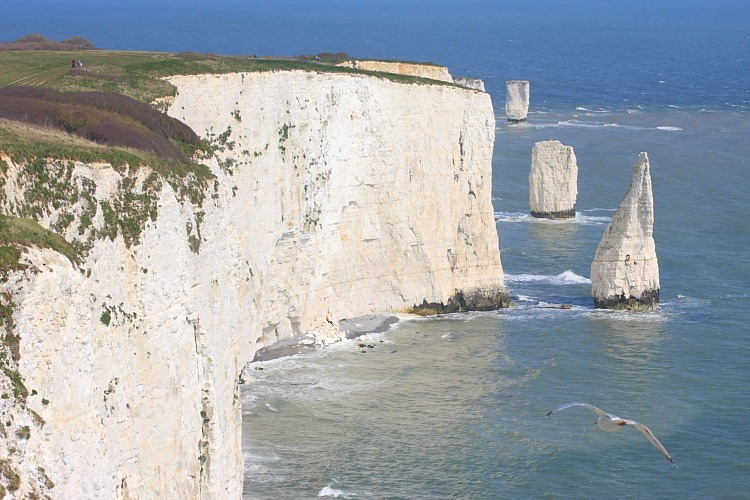 I think we both found them to be to be visually more impressive than the more famous Old Harry. Oh, and “Old Harry” was apparently a mediaeval name for the Devil who used to sleep on top of it, when he wasn’t tossing Agglestone Rock onto Godlingston Heath. My GPS reckoned the walk was more like 7½ miles, to which we added another 2 miles food shopping in Wareham. Wareham is a very pleasant old Saxon town that would benefit from better parking facilities. Great day, great walk – most enjoyable.